Does it ever happen to you? Does a certain “smell” bring you back to sweet, fun memories? For some, it may be coconut to remind them of the beach. But my smell? My smell is chlorine. That smell ultimately drew me back to the pool and saved my life. 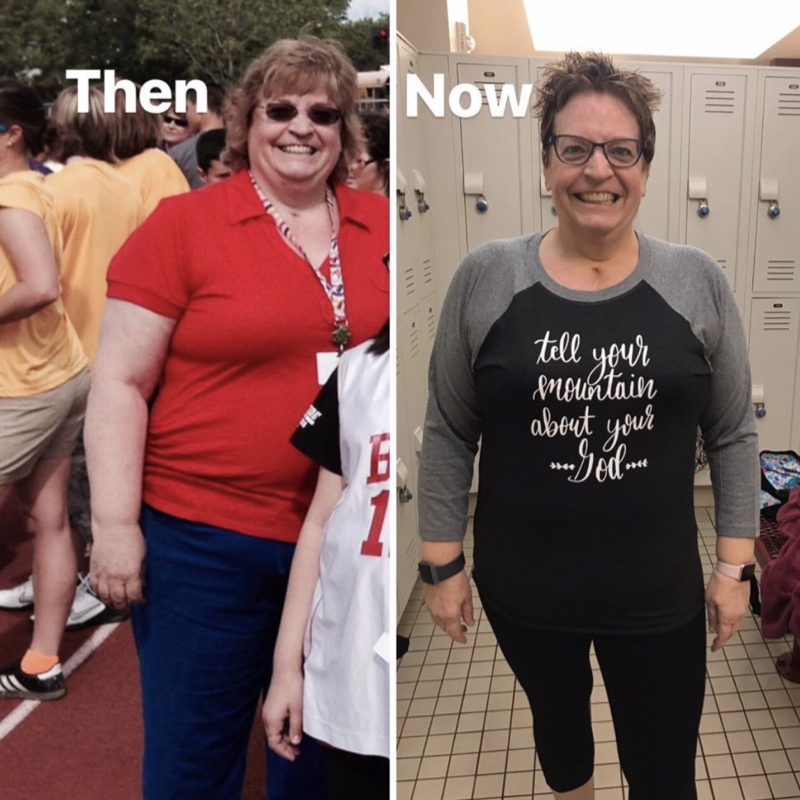 My name is Patty, and I want to tell you a story of how a lot of hard work, sweat and tears have helped me lose 75 pounds, rediscover my love of swimming, and change my life forever. Before I began this journey, I was very inactive and weighed 276 pounds. I grew up swimming, and competed for 4 years in college, but after I stopped swimming at age 23, I put on a lot of weight and struggled after trying multiple weight loss programs to shed it. 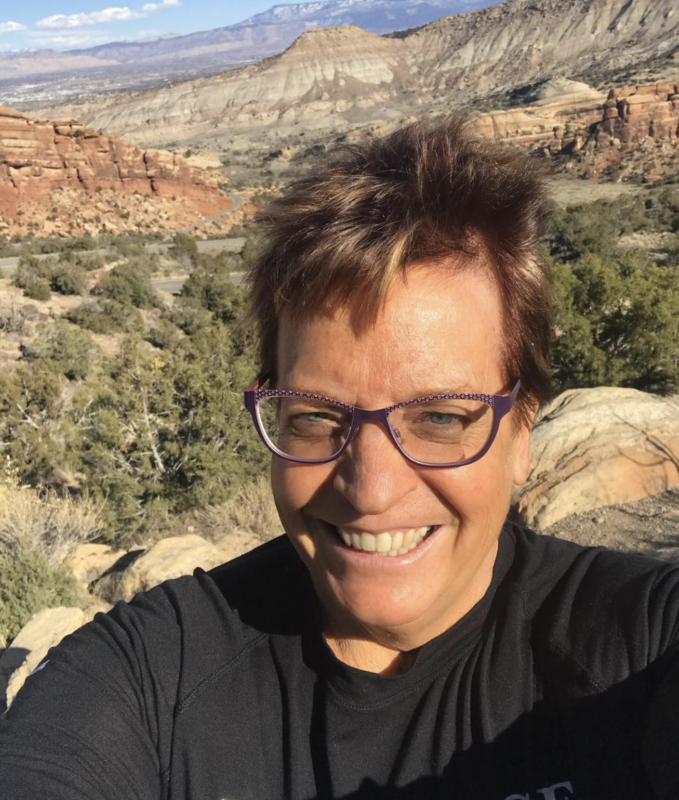 My body was constantly attacking itself with autoimmune diseases, like Hashimotos and Rheumatoid Arthritis and the vicious cycle of failing to lose the weight was heart-wrenching. Well, that “rule” kept me away from my greatest joy, swimming, for the last 25 years. In January 2016, I was nearing 300 pounds when a personal trainer approached me and said he could help. I was VERY skeptical, but I also felt like I maybe had one more year to live, if I didn’t figure this out. So I agreed to let him help me. I decided it was time to make a change. I got back in the pool, once a week. I felt like I was starting back at zero. It was difficult to even swim 100 yards without stopping. I used a book I had from 1980 called “Swimming for Total Fitness.” I would write down a workout from the book on an index card and bring that card to the pool deck. After a couple of months of that, I thought “there has to be an app for swimming?” So I searched the app store, and found MySwimPro! I purchased a MySwimPro ELITE membership, and started doing the Workout Of The Day every time I swam. These workouts were around 1 hour long, and consisted of a warmup, a main set, drills, and a cool down. Outside of swimming, I was improving on my weight lifting, nutrition and walking to help with my cardio. Even though I was only swimming once a week, I was getting pretty excited about my progress! I began with the app on my phone and progressed to the Apple Watch. 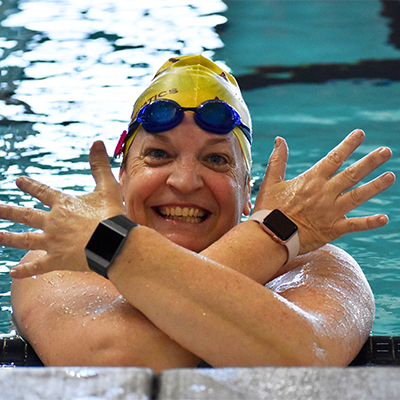 At first, I was very timid to show up at a Masters’ swim practice, so I loved that I could get a swim workout via an app on my phone or smart watch and go at my pace. 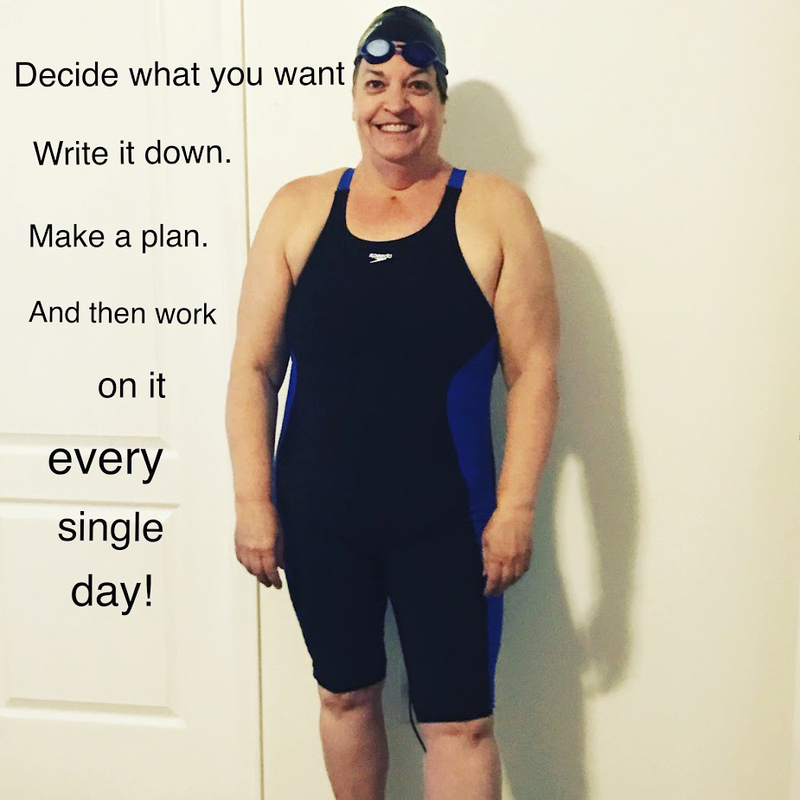 I started my journey swimming just once a week, and with the Workout of The Day with MySwimPro, it was so easy to consistently do a great swim workout. I love that you can put your times in the app and then the workouts are adjusted to your speed. I also LOVE the training videos in the workouts. I have been out of swimming since 1985, and when I competed, we didn’t even wear goggles to compete! I did not remember any drills. Now, I play the videos on the pool deck before I begin a drill. There are very helpful. With MySwimPro, it’s so easy for me to head to the pool, and know I’m getting a good workout that’s right for my swimming level. 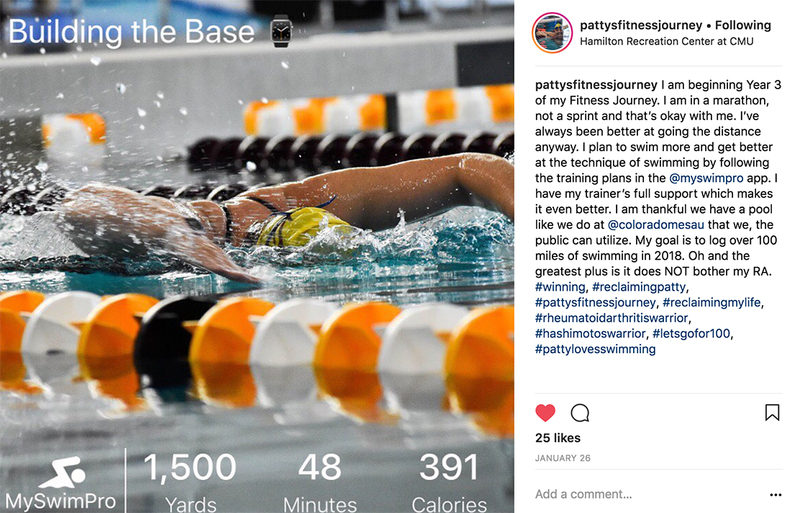 Since joining MySwimPro, I’ve enjoyed learning from Fares and his team, connecting with other swimmers on the app, and getting motivation from the MySwimPro Community Facebook page. 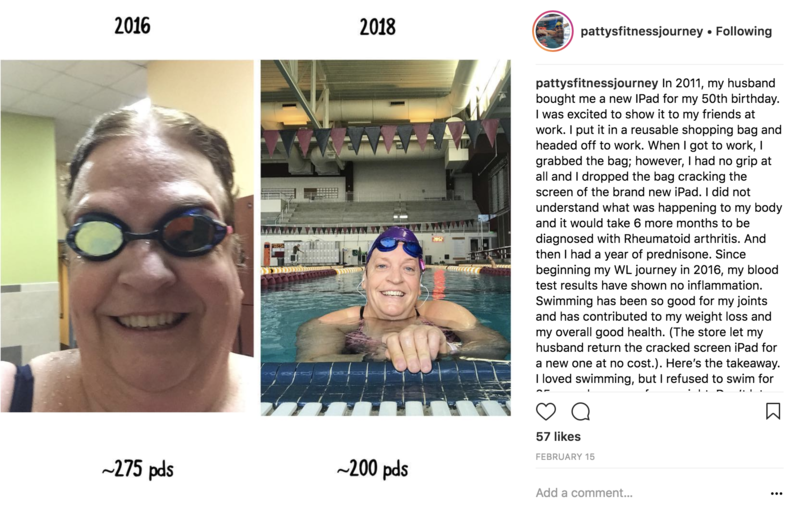 When I first joined MySwimPro, I definitely wondered if there were others like me (over 50, just getting back into swimming, getting back to being fit etc.) or if it was mainly current competitive swimmers. The community has shown me there are people of all ages and abilities, and every one of them encourages me. The MySwimPro app is literally great for swimmers of all ages and abilities. It will get you back in the groove again. Swimming is so, so good for your overall health. I tell everyone I know about this app. I literally love it! When I started the Premium membership, I got the blessing of being on a phone call with the MySwimPro team, and the co-founder, Fares asked me about my goals. I told him that I wanted to start competing, but that my flip turns were a big challenge for me. I could barely swim 100 yards, without having to stop after my first flip turn, because I was too tired. 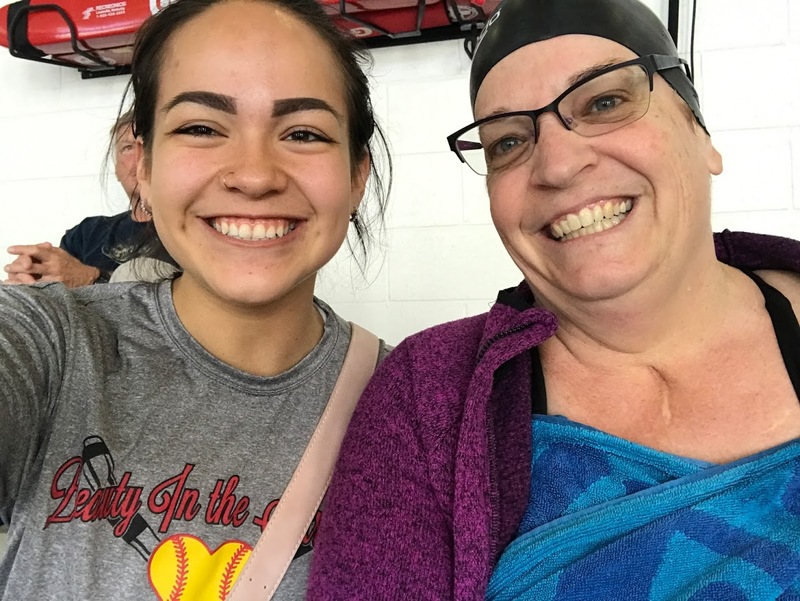 I quickly challenged myself to swimming the 500 Free in the Senior Games, in August of 2016. I trained with the MySwimPro workouts, swam the race, but only did 1 flipturn. But – I won my age group! Then I signed up for the Masters’ State Swim meet in March of 2017 for the 1,000 Free! I completed the 1,000 Free, only flipped 3 turns, but, I came in 3rd in my age group! It was an amazing feeling racing again, but when I got back home, I was determined to fix my flip turns. I just couldn’t get myself to flip every turn. I decided to commit more time to swimming. 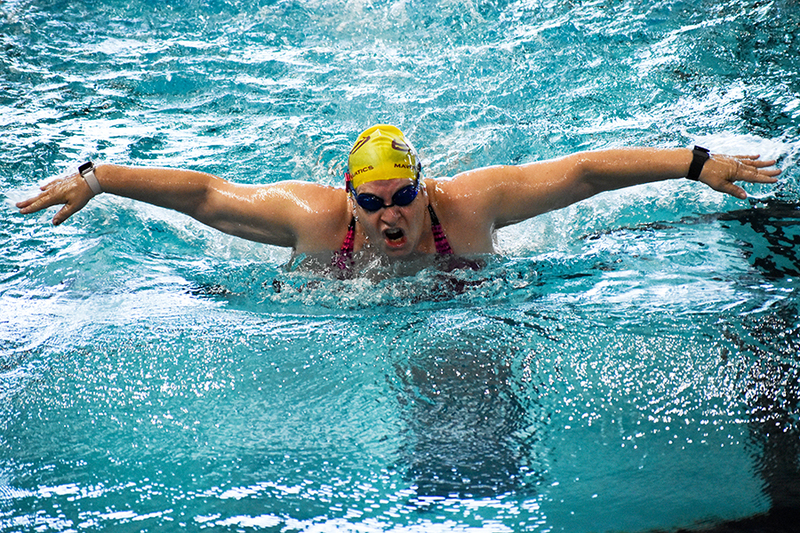 I began swimming 3-4 times a week and my endurance began to build exponentially. 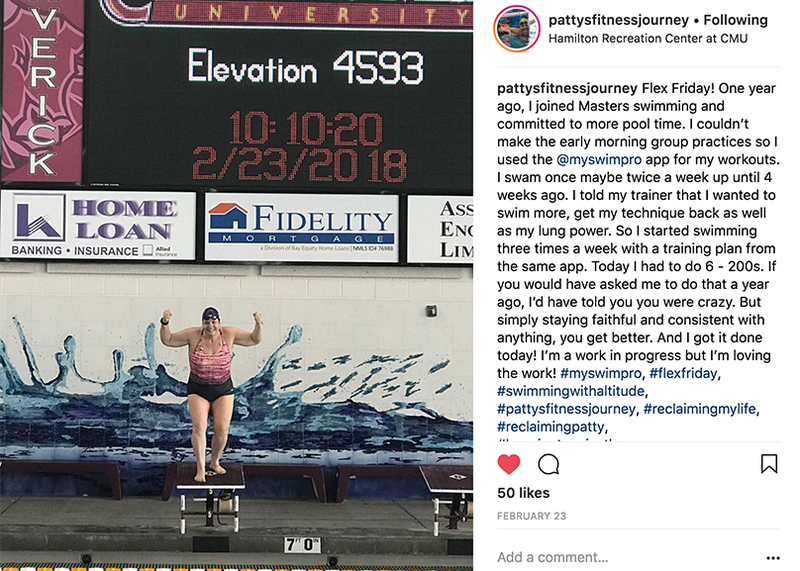 I was highly motivated to reach my goal, and MySwimPro helped me stay on track by making it really easy to get the proper training I needed. 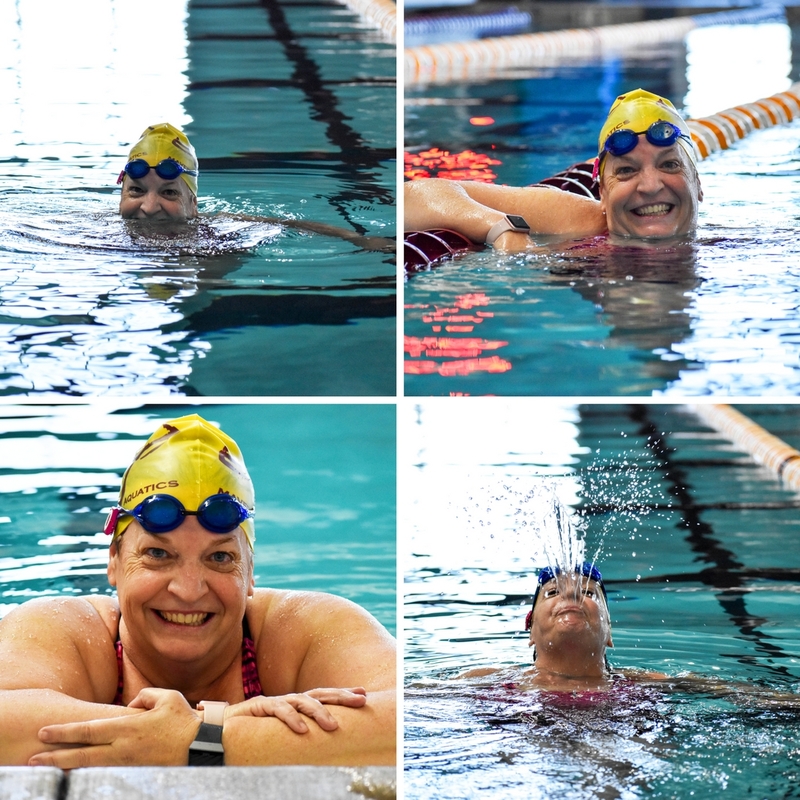 The variety of workouts made swimming fun, and I’m still always learning and getting better. Recently, I participated in the 30-minute challenge in the SmartyPants Vitamins USMS Fitness Series. And guess what?! I swam 1,700 yards and flipped EVERY turn. That commitment to swim more and practice my flip turns each time I swam had paid off. Flip turns had become habit. Since I have been back in the water now for almost 2 years, my overall health has improved immensely. I still am not at 175 pounds, BUT I have lost over 75 pounds since incorporating swimming with MySwimPro and working with my trainer, Ryan. 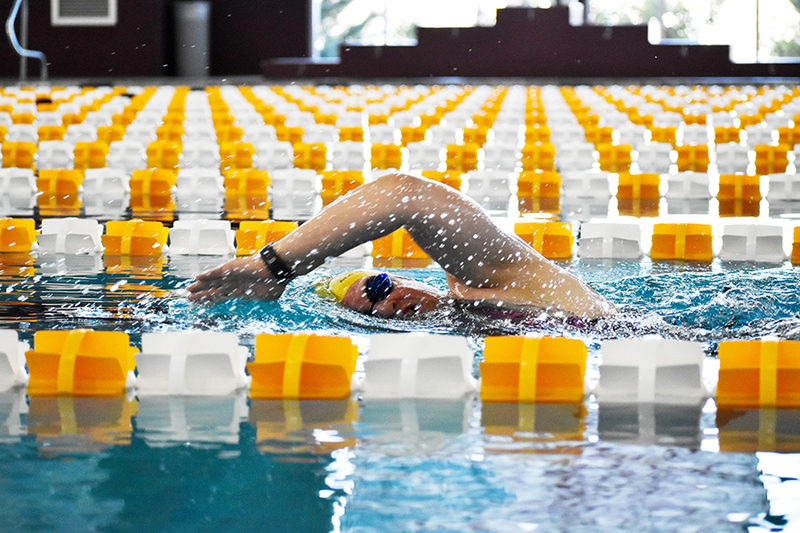 I absolutely love that the sport I love – swimming – is gentle on the joints. My hips used to pop out of place as I walked, my blood pressure was high, my Hypothyroidism exhausted me, and my Rheumatoid Arthritis used to be so flared up, it was difficult to make a fist. I don’t feel any of this now! My hips are strong, my thyroid medicine continues to drop in dosage, my inflammation markers for rheumatoid arthritis continue to be in remission, and the cold pool water feels excellent on my joints. I am swimming again, I am reclaiming my life, and I have never been happier! The future is bright! As of January of 2018, I am doing the Improve Endurance Training Plan in MySwimPro. Starting this training plan has given me a goal, and a clear plan. And it’s most definitely working. I’m excited to race again in 2018! Every year at the Colorado State Masters Swim Meet, they give out the Brute Squad Award to the elite swimmers who compete in the 200 Fly, 400 IM, and 1,650 Free. 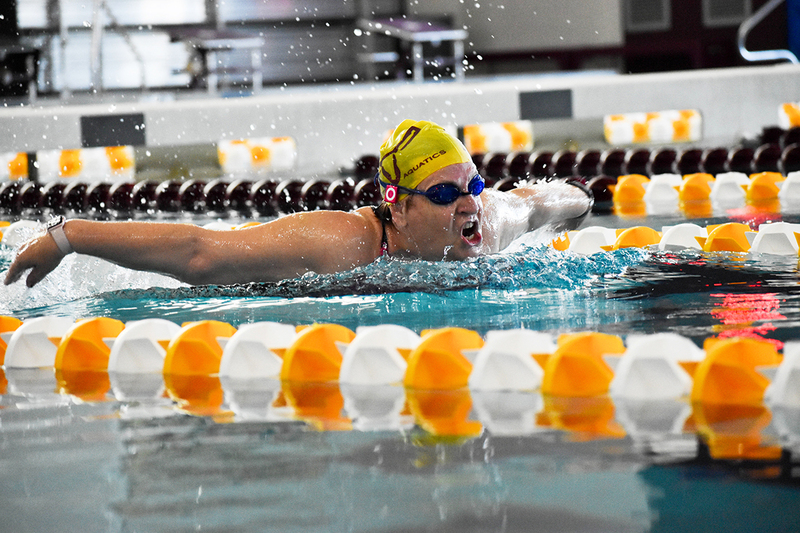 When I first heard about the award, I thought “No way could I do that!” But, after reading the Gold Medal Moment about Michael’s 400 IM, I realized how much stronger I have gotten in the pool by being consistent with my workouts. I think winning the Brute Squad Award will be my new goal. It may not happen right away. But I am going to pursue a goal of swimming the 200 Fly, 400 IM, and 1,650 Free at State! Do not let your fears of how you might be perceived, stop you from doing what you love to do! If you have a #GoldMedalMoment you would like to share with us, we’d love to hear it! Send us an email at contact@myswimpro.com. I am so proud of you, Patty and happy that you are back in the water. Some of our favorite times when you were younger were at the pool. Congratulations from Buenos Aires, Argentina. Really a nice story. Keep going!!! go girl go….i can’t afford a watch or better coach but will do my open sea swim…to robben island someday…aspeling paul. Thank you for sharing your story. I am going through something very similar at the moment. Ive gained weight due to being unwell and self conscious to get back in the water. I used to swim 3 times a week and also did open water swimming. Your story has got me thinking that I need to dive right back into what I enjoy most. Thanks and good luck with your further swim ventures.